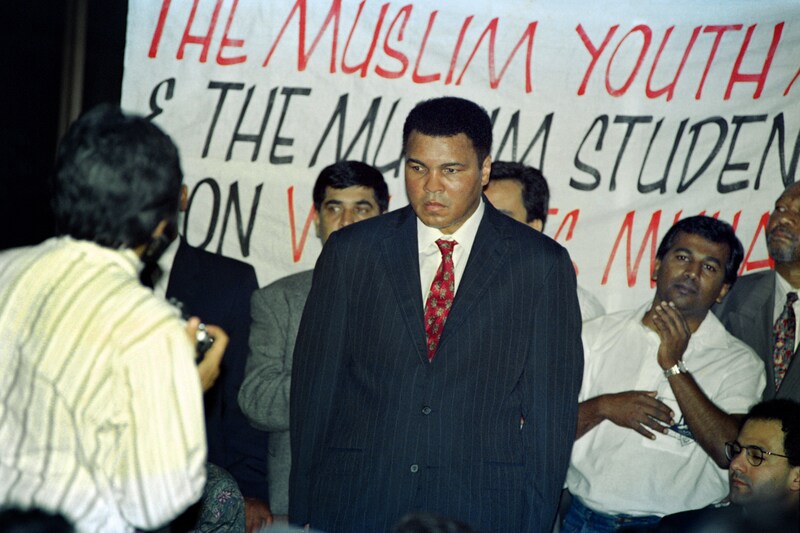 Because, of course, the political climate that we're in (and Twitter) won't allow us to simply mourn the death of a legendary boxer and amazing person, the Internet is here to remind us that Islamophobia is alive and well. In the wake of the death of Muhammad Ali there are tons of anti-Islam reactions stemming from the boxer's Muslim faith. For some people, apparently, it is impossible to even briefly lay aside someone's religion (much less, you know, tolerate it) and let people celebrate the life of a man who changed the world for better. Ali died late Friday night in Arizona at the age of 74, and it took Twitter less than 24 hours to reduce his death to a fight over the Muslim faith. Ali first started attending Nation of Islam meetings in 1961, just one year after he changed the boxing world forever at the Rome Olympics. He continued to embed himself in the movement of African American Islam movement. In 1964, Elijah Muhammad, the leader of the Nation of Islam, renamed the boxer (formerly known as Cassius Clay, which he called his "slave name") Muhammad Ali, which means "praised one." Ali was outspoken about his Muslim faith, and was arguably the most famous representation of the religion in the United States. Unfortunately, in his death, that means that he is open for rampant criticisms that will make you face palm into oblivion. On Friday night, comedian W. Kamau Bell predicted what was coming. Unfortunately, he was completely on the nose. This guy couldn't even wait until Ali was confirmed dead before weighing in with his hatred. It's unfortunate that many people choose this moment to celebrate and highlight intolerance. Even Donald Trump managed to not bring up the fact that Ali was Muslim in his tweeted tribute, though it should be noted that Ali took Trump to task for his proposed Muslim ban only months ago. Fortunately, most of the outpouring on Twitter is positive and supportive, highlighting Ali's faith and the way that he embraced his blackness in an era that was particularly hostile to African Americans. Despite the naysayers, I can only hope that continues to be the dominant narrative: that a great athlete who gave so much back to the world was also a proud Muslim and black man.